The difference between eukaryotic and prokaryotic cells is that eukaryotic cells are those which have a membrane-bound nucleus that contains genetic material, as well as organelles that are also membrane-bound. Whereas, prokaryotes are cells that don’t have a nucleus or membrane-encased organelles. While this is the basic difference between prokaryotes and eukaryotes, there are other differences that merit a close examination. All living things are composed of cells. However, there are different kinds of cells and cells are divided into one of two groups: prokaryotic cells and eukaryotic cells. Eukaryotes (living things with eukaryotic cell structures) and prokaryotes (living things with a prokaryotic cell structure) are similar in many respects, but they have key differences including different organelles that carry out different functions. As previously mentioned, the major difference between prokaryotic and eukaryotic cells is that prokaryotic cells lack a nucleus or organelles encased by a membrane, while eukaryotic cells have these features. The distinction between eukaryotes and prokaryotes is based upon two theories regarding the role of cells in biology. Cell theory states that all living things are made out of cells, and biogenesis theory proposes that all living cells came from other existing cells, so cells cannot spontaneously arise from non-living things (abiogenesis). For cells to comprise all the life we see on Earth they must be able to organize proteins and other chemical compounds. Individual cells are capable of keeping chemical processes isolated and compartmentalized so one chemical process doesn’t interfere with another chemical process, which runs the risk of disrupting the delicate chemical balance of the cell and leading to cell death. 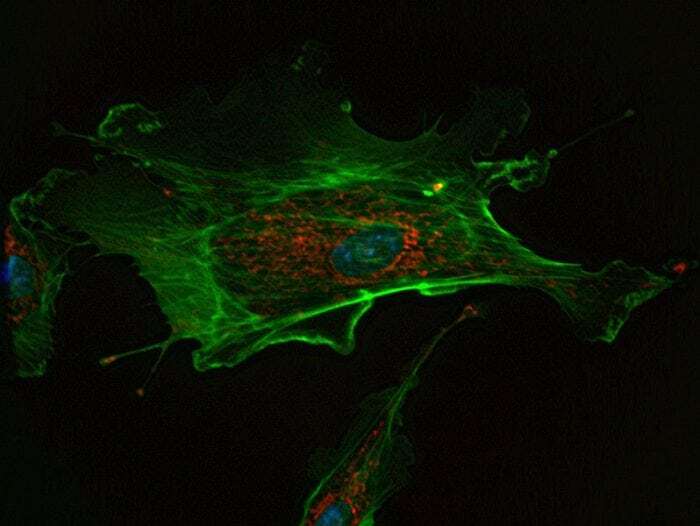 To keep the chemical processes within a cell isolated and organized, cell components stay enclosed within a membrane that serves as the barrier between the interior of the cell and the cell’s environment. The membrane of a cell is selectively permeable, meaning that the cell will allow some chemical compounds into the cell and not others. The membrane of the cell is made out of a phospholipid bilayer, two groups of lipids arrayed in layers and facing opposite directions. Smaller compounds can penetrate the phospholipid bilayer, but larger compounds must enter the cell using a pore in the cell membrane. The cell membrane has various methods of regulating how chemicals move in and out of the cell. Diffusion refers to the tendency of molecules at high concentrations to distribute out to areas of lower concentration until the concentrations across the two areas equalize. Osmosis is similar to diffusion, but it refers to the movement of a solvent across a boundary instead of a solute. This helps to equalize a solute that can’t move through a boundary. Selective transport, the movement of molecules within the cell, is handled by both membrane pumps and membrane channels. Prokaryotes are made out of cells that don’t have a nucleus or organelles enclosed by membranes. Since prokaryotic cells don’t have a nucleus, the DNA of the cell isn’t locked within a nucleus. While prokaryotes don’t have a membrane-bound nucleus the region that contains the DNA in a prokaryotic cell is a central region referred to as the nucleoid. The DNA of prokaryotes is overall less structured than the DNA found in eukaryotes. DNA structures in prokaryotic cells are usually only a single loop, while the DNA found in eukaryotic cells are bundled together in chromosomes. A eukaryotic cell typically has the following cell parts: cell wall, plasma membrane, flagella, pili, cytoplasm, nucleoid, plasmid. Another key difference between prokaryote organisms and eukaryote organisms is that most prokaryotes are single-celled organisms, though a few exist that are made out of small collections of cells. Bacteria and archaea are the two different forms of prokaryotes that scientists recognize. Archaea are single-celled microorganisms that have genes and chemical/metabolic pathways that are more similar to eukaryotes than bacteria. Archaea lack a cell wall, whereas bacteria have a cell wall composed of peptidoglycan. Many bacteria also have a polysaccharide capsule. The function of the cell wall is to give the cell extra protection from harmful compounds in the environment. The cell wall also helps the cell maintains its shape and defends against dehydration. The polysaccharide capsule lets the cell stick to surfaces in the surrounding environment. 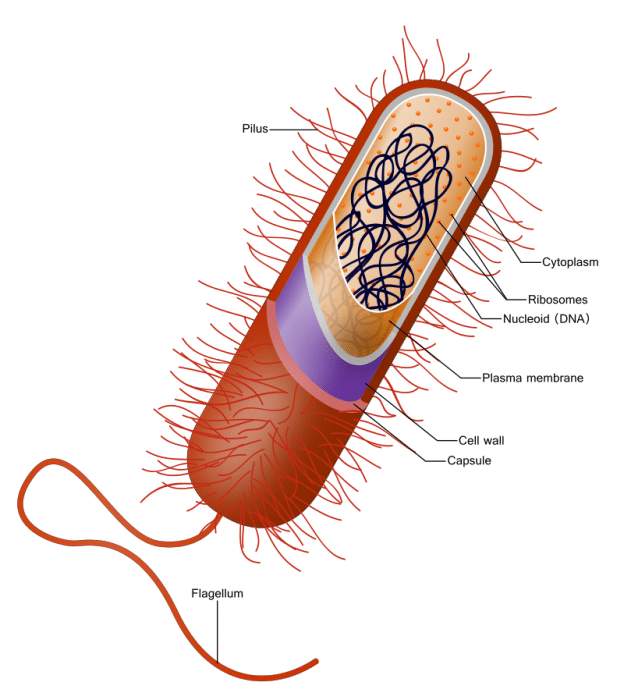 Prokaryotic cells often have tail-like structures called flagella, which are used to propel the cell around. The cells also have small tendrils called pili that are used to exchange genetic material during a form of reproduction called conjugation. Eukaryotic organisms are made out of cells that possess membrane-bound organelles and a membrane-bound nucleus. The genetic material of eukaryotic organisms is found within the nucleus of the cell and chromosomes are how the DNA is organized within the nucleus. Eukaryotic cells comprise both single-celled and multicellular forms of life. Eukaryotes compose the bodies of all protists, fungi, plants and animals. Eukaryotic cells display an impressive amount of diversity, and they are capable of being many different shapes and sizes. 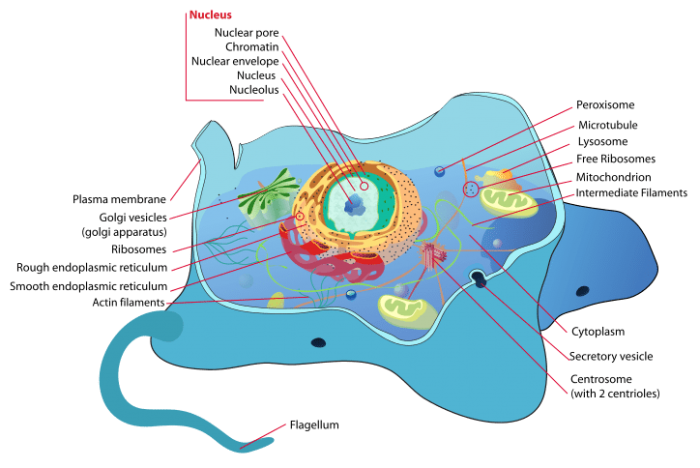 The structure of a eukaryotic cell is tied closely to its function. For example, the epithelial cells that make up the human body are usually divided into three different types: squamous, cuboidal, and columnar. Each of these different cell types has a different form that enables it to carry out its respective function. Cell wall (only plant cells), plasma membrane, nucleolus, nucleus, chromosomes, vesicles, golgi apparatus, ribosomes, endoplasmic reticulum, cytoplasm (and cytoskeleton), lysosomes, mitochondria, centrioles, chloroplasts (only plant cells). Prokaryotic cells are almost always much smaller than eukaryotic cells. The size of a prokaryotic cell is usually around 1 µm while the size of animal cells and plants cells are usually between 10 to 100 µm. Because Eukaryotic cells are much larger than prokaryotic cells they have evolved special methods of transporting substances around the cell that bacteria don’t have. Prokaryotic cells are single-celled, have no membrane-bound nucleus, have a circular DNA shape, reproduce asexually, are much smaller than eukaryotes, and are divided into bacteria and archaea. Eukaryotes can be multi-celled, have a membrane-bound nucleus, have linear DNA, are capable of reproducing sexually, are much larger than prokaryotes, and make up plants, animals, protists, and fungi.